Some commentary and images courtesy of Jill Beithon, RT, RDMS, RDCS, RVT. This topic covers fetal age and growth assessment for the second and third trimester (14 -40 weeks gestation). 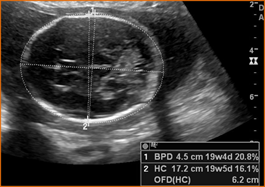 Fetal images demonstrate the methodology for obtaining accurate fetal measurements. Above. Crown rump length at 11 weeks. 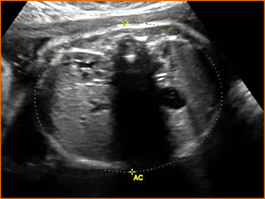 The first trimester crown rump length (CRL) is the most accurate method to determine gestational age and once established should not be changed. The CRL is defined as the longest embryo length excluding the limbs and yolk sac. It is the measurements between the top of the head to the distal sacral area. Above. Note the increased CRL with advancing gestational age. Above. 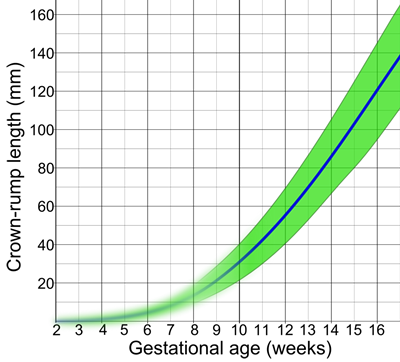 CRL versus gestational age courtesy of: “Medical Gallery of Mikael Häggström 2014,” Wikiversity Journal of Medicine. 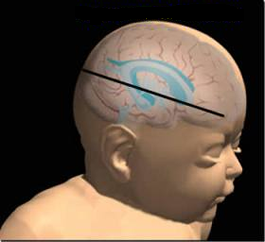 Beginning at 13 to 14 weeks gestation the biparietal diameter (BPD), the head circumference (HC), the abdominal circumference (AC), and femur length (FL) should be measured. Above. This is the same acquisition plane for the BPD and HC. 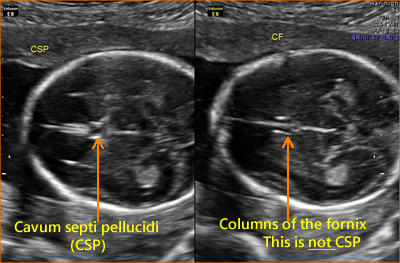 Visualization of the thalami, the midline falx, and the box-like cavum septi pellucidi (CSP) are possible. The presence or absence of the CSP is a key factor in defining abnormal brain anatomy. 1. The BPD can be measured through any plane that crosses the 3rd ventricle, thalami, and cavum septi pellucidi (CSP). 2. 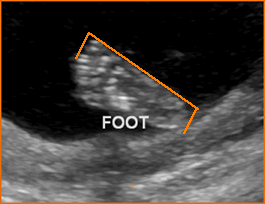 The calvaria should be smooth and symmetrical as indicated. 3. 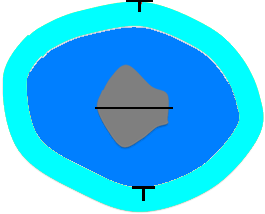 The cursor in the near field should be placed on the outer edge of the calvaria and the cursor in the far field should be placed on the inner edge as indicated. 1. Measurement is through a plane that crosses the 3rd ventricle, thalami, and CSP. 2. The calvaria should be smooth and symmetrical. 3. 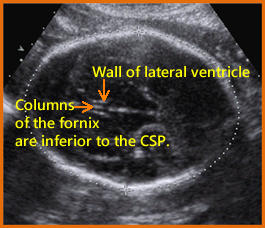 The cavum septi pellucidi (CSP) should be visible in the anterior portion of the brain. 4. Caliper placement is around the calvarial wall and should not include scalp thickness. Above. The CSP appears as a box like structure in the anterior portion of the brain as demonstrated. The hyperechoic lines represent the medial walls of the lateral ventricle. Above. 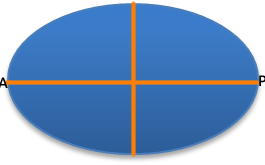 The 3-lined structure is not the CSP and represents the columns of the fornix. 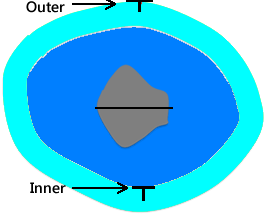 The fornix represents paired nerve columns, which are located just inferior to the CSP. 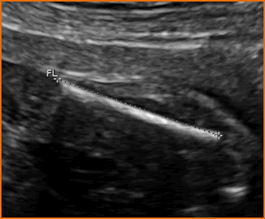 The transaxial view when the fornix is seen suggests that the transducer plane is just inferior to the proper plane to obtain the CSP. Above. Note the difference between the box like structure, the CSP, and the structure with 3 parallel lines, which represent the columns of the fornix. Above. 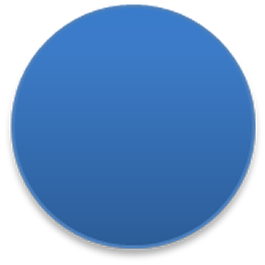 Dolicocephaly is defined when the AP diameter is longer than the transverse diameter and the CI is <70% (> 2 SD). Dolicocephaly may be seen in a number of conditions, including oligohydrmnios and multiple gestations. Above. 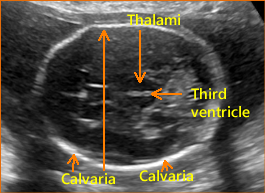 Brachycephaly is defined when the transverse diameter is greater than the AP (anterior posterior) diameter and the CI is > 86% (> 2 SD). Brachycephaly may be seen in a number of conditions including synostosis, trisomy 21, and hydrocephalus. Above. 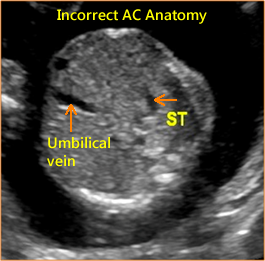 The AC measurement should be taken at the skin line on a true transverse view at the level of the junction of the umbilical vein, portal sinus, and fetal stomach. At this location, the liver size is reflected. The visualized ribs should be symmetrical. 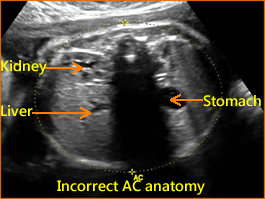 The abdomen should not be compressed during image acquisition. Above. Correct AC measurement. Note placement of cursor outside skin line. Again, ribs are symmetrical. 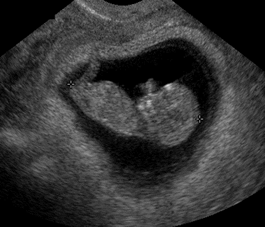 The stomach is seen and both the umbilical vein and portal sinus are identified. Above. Incorrect imaging of AC. 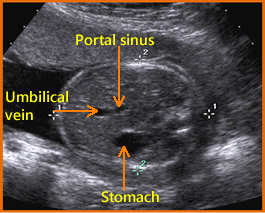 Note that the portal sinus is not seen, the rib images are not symmetrical, and the stomach is not well visualized. Above. Incorrect imaging of AC. The liver is visualized, but the portal sinus is not well defined. 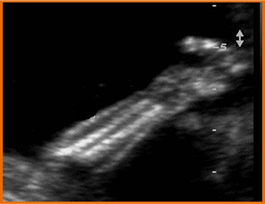 The rib images are not symmetrical and the stomach is not well visualized. Above. Incorrect imaging of AC. 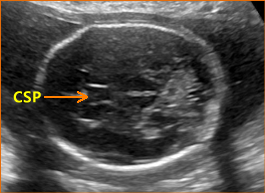 The liver is visualized, but the umbilical vein is not seen and the portal sinus is not well defined. The kidney should not be in the field of view. 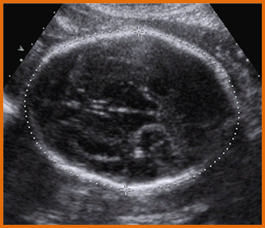 The stomach is seen but not in relationship to the umbilical vein or portal sinus. Above. 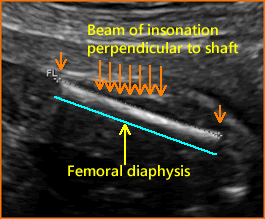 The long axis of the diaphysis of the femur is most accurately measured when the ultrasound beam of insonation is perpendicular to the shaft. The cartilage at the ends of the femur should not be included in the measurement. Above. Only the diaphysis should be measured between the epiphysis, which represents the portion of the long bone formed by the primary ossification center. Above. 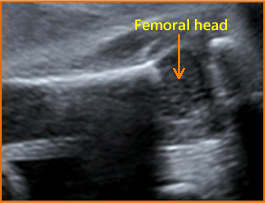 Note the femoral head which is distinct from the femoral epiphysis. Above. The principles of HL measurement correspond to those of the femur. 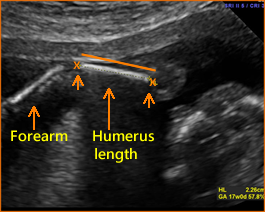 The insonation of the ultrasound beam is best directed in a perpendicular fashion and the diaphysis alone is measured after the forearm and shoulder region are identified. Above. The ulna is longer than the radius. Note that it extends into the elbow, higher than the radius. 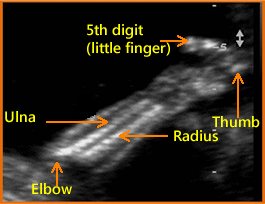 The radius is on the thumb side and the ulna is on the 5th digit or little finger side of the forearm. Again, the measurement is easier to establish when the ultrasound beam is perpendicular to the long bone. 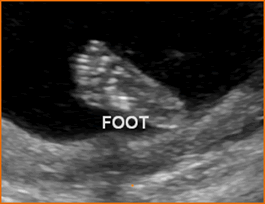 Among the bones of the lower leg, the fibula is smaller than the tibia. The tibia is longer than the fibula and the tibia originates closer to the knee compared to the fibula. Above. The orbits and the lens of the eye can be viewed when both orbits are in a coronal or axial view and are most easily visualized when the fetal head is in a direct occiput posterior position. The BOD is measured from the outer edge of one orbit to the outer edge of the other orbit. 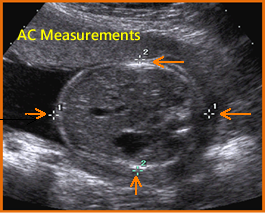 These measurements may be useful in assessing certain syndromes, potential karyotype abnormalities, severe growth restriction, or in assessing fetal age when other measurements are difficult to obtain. The IOD represents the outer edge to outer edge distance between the orbits. It may be measured for the same reasons that BOD is measured and when facial anomalies are suspected. 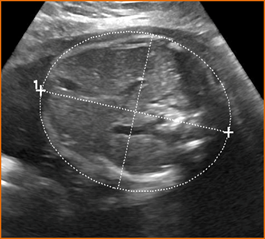 Accuracy of 3-D ultrasound compared with MRI in diagnosis of Mullerian duct abnormalities. Three­-dimensional (3-D) ultrasound compared with magnetic resonance imaging (MRI) in the diagnosis of Müllerian duct anomalies is highly accurate. 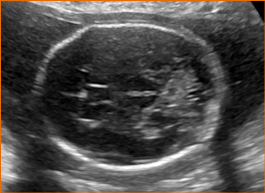 (This article is an excellent review of certain uterine anomalies. The full text is available at: https://obgyn.onlinelibrary.wiley.com/doi/full/10.1002/uog.14825). 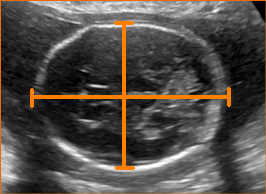 After being suspected of a uterine anomaly on two-dimensional scanning, 60 women were evaluated with 3-D ultrasound and with MRI. Compared with MRI, 3-D ultrasound had a sensitivity of 100% for dysmorphic uteri, and the kappa was 1.00. 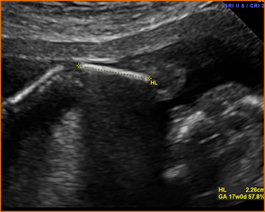 For hemi­-uteri, the sensitivity was 100%, and the kappa was 1.00. For septate uteri, the sensitivity was 100%, and the kappa was 0.918. 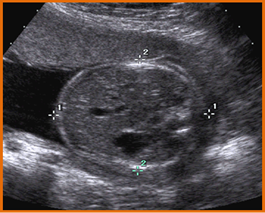 For bicorporeal uteri, the sensitivity was 83.3%, and the kappa was 0.900. 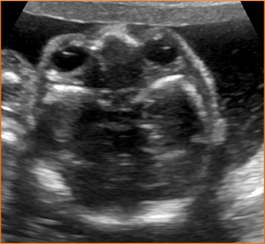 Therefore, 3-D ­ultrasound is highly accurate for diagnosing uterine malformations, and it also has a good level of agreement with MRI in the classification of different anomalies. Among 4000 women who underwent a second trimester scan, a small percentage were incomplete due to unfavorable fetal position. Among the study population, 4.2% returned for a follow-up scan within two weeks. 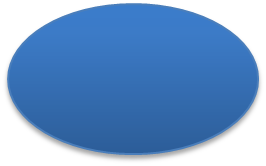 Only one view was needed in a subsequent scan in 2.6%, while 1.6% required more than one view. The most difficult organs to visualize during the initial scan were: corpus callosum (1.8%), fetal face (1.7%), cerebellar vermis (1.1%), and fetal heart (1.0%).